I met with a prospective client yesterday who clearly at the beginning of our conversation saw providing learning and development for his employees as a cost rather than as an investment. I shared with him an old yet powerful story where the CFO asks the CEO: "What if we invest in our people and they leave?" To which the CEO responded: "What if we don’t and they stay?" Investment or cost is a vital distinction to make in all aspects of your business, and particularly where people's performance is concerned. What do you believe? 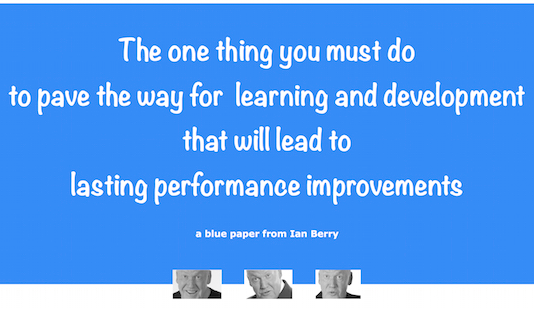 I believe there's one thing you must do to pave the way for learning and development that will lead to lasting performance improvements and a very healthy return on your investment. And it will help you also to retain and engage your current employees more, meaning you will avoid the 1.5 to 3.0 times a person's wages/ salary you have to invest to replace people who leave. I've written a short Blue Paper about the one thing.